John and I had the good fortune to live, work, and vacation in Australia for almost exactly one year beginning in September 1994. 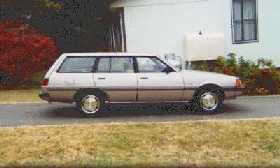 Our base of operations was the capital city of Canberra while John worked at Mount Stromlo Observatory. We met many great people and experimented with new and interesting ways to cook for them. We made our home away from home in a cozy cottage nestled in the hills west of Canberra. 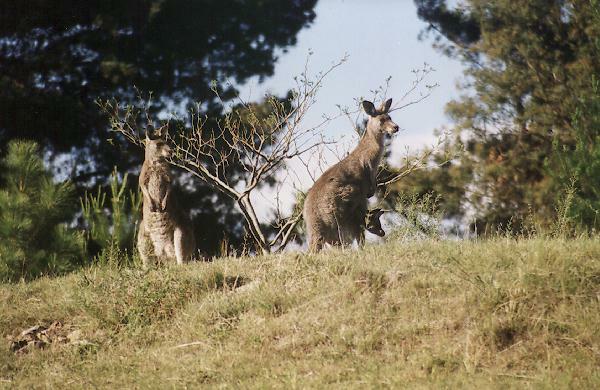 It featured kangaroos in the backyard, and views of the nearby Brindabellas. 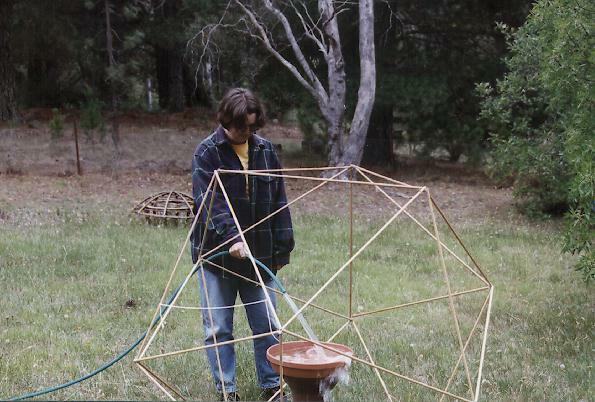 Of course, no house is complete without its own icosohedron. Or see the wheelie bin in action for even more excitement! Several travel adventures occurred during the year. A quick hop to Lord Howe Island. We finished our Australian stay with a Road Trip Outback Down Under, a two month, 8000km trip zig-zagging across the eastern third of the country. On our last night on Mt. Stromlo we took a look through the "Ottie" telescope, a 9-inch refractor that's was (I think) used very early in Stromlo's history to judge the quality of the site for a larger telescope. The Ottie is an amazingly cool piece of mechanical design. Lots of gears and governors and counterweights, etc., all made of brass and beautifully crafted. The optics are nice too, but you can probably get an equivalent view from any good amateur scope today. The beauty of the thing is in the mechanics. The dome is fun too. It's rotated by manual power. You pull and pull and pull on a rope that is geared down so you can move the dome oh-so-slowly. I wish I had discovered the Ottie earlier in the year.